These DIY Gold Bubble Number Balloons are made with fabric and stuffing (like pillows)! 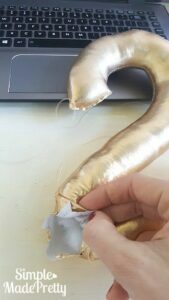 Keep in mind that these do not float like balloons filled with helium 🙂 The possible ways to use these gold fabric numbers are endless! I made some to celebrate the new year (2018) but plan to make numbers 1-12 to give to a friend to use as props for her new baby photos (months 1-12). These would make a cute gift idea for expecting mommas or those that love fun pillows and party props! I used my Cricut Maker Machine to make these in minutes, but you can easily cut fabric by hand to make some of your own. Keep reading to see how to make these and watch the how-to video for even more tips! 1.Cut the fabric using a Cricut Maker Machine or cut by hand using your own template. I used Arial Black font sized at 11″ x 8.5″ for each number. 2. Make sure to cut 2 sides for each number. One side needs to be flipped (you can use the mirror setting on your Cricut) so when sewn together, you have gold on both outside pieces. 3. Sew each piece with the gold side facing each other leaving a small opening to flip right-side out. 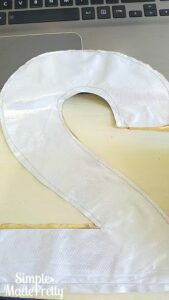 Sewing numbers with the circle can be tricky, I just left the inside circles for “0” and “8” open until I was ready to flip it right-side out. 4. Flip right side out and begin to stuff each number. This was the most time consuming for me. I was secretly wishing I had one of those Build-A-Bear stuffing machines, hehe. 5. Once you have the number stuffed, sew the opening closed. Complete these steps for the rest of the numbers. These DIY Gold Bubble Number Balloons is an easy project that can be done in no time with a Cricut Maker machine. 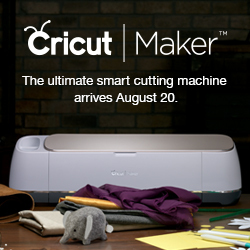 Go here to learn more about Cricut products and get a machine today! If you don’t have a Cricut machine, just print some numbers in the Arial Black font and use as a template to cut your fabric. Throw a fun New Year’s party with these fun DIY Gold Bubble Number Balloons or make some to use as props. These are will be fun to use in years to come for birthday parties and other milestone celebrations!